As owners of a disaster-restoration firm, Michael Graham and John Perini have come across their fair share of accidents. But not every rehab is cut-and-dried. Case in point: After a large home in Oakland Township burned to the ground three years ago, the pair weren’t sure it could be rebuilt. “There were no building plans. All we had was a postcard picture and memories,” says Graham, co-owner of Maxim Construction Inc., in Sterling Heights. The home, complete with a backyard Japanese garden, was completed 13 months later. Former insurance adjustors turned contractors, Graham and Perini have been witness to multiple misfortunes in their 20 years in business, along with peculiar personalities. Meanwhile director of business development Medina Hunter works with insurance companies to attract and streamline referrals. That’s become increasingly vital, as new building codes have improved safety. The company also operates its own wood and fabrication shop to fulfill custom orders, which helps drive down costs and speed up turnaround times. 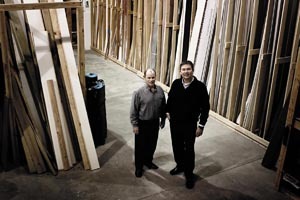 Mother Nature plays a role in the firm’s success, as well. Maxim’s most active years were in 1999 and 2000, when a series of ice storms caused considerable damage in the region. High winds add another element of growth.